Date codes: 156, 170, 177, 192, and 336. The object consists of five pieces which are alloy junction experimental prototypes for performance testing. 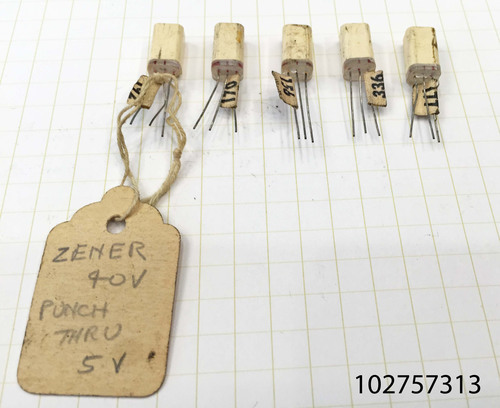 The piece with the date code "192" has an attached tag that says, "zener 40 V punch thru 5V." "Raytheon White Epoxy CK718 Prototypes (5 pieces), developmental germanium PNP alloy junction transistors. Early to mid-1950s. Raytheon was the first to market readily available germanium alloy transistors, with the CK718/721/722 devices, beginning in late 1952. Commercial versions of these transistors used black epoxy resin cases, with the type id and date codes stamped on the case. Raytheon used white resin devices for experimental studies and prototypes. Often these prototypes were hand labeled or otherwise identified with tags. 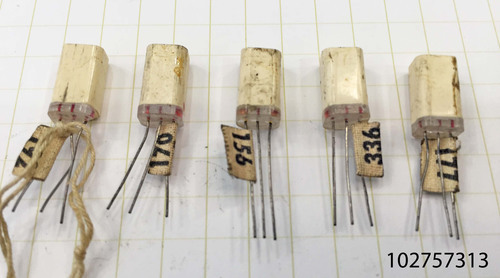 The transistors in this lot are tagged with formal printed number identification, and so were likely used in an engineering study. The leftmost transistor also is tagged with handwritten voltage measurement data. Rare - white epoxy resin Raytheon 1950s prototypes were not produced in large numbers, and very few have likely survived over the past 60+ years."